Over the course of my history studies, I have spent many hours reading about and studying the Tudors of English history. I have also written a number of papers on the Tudors and given several presentations beyond those in my classroom. 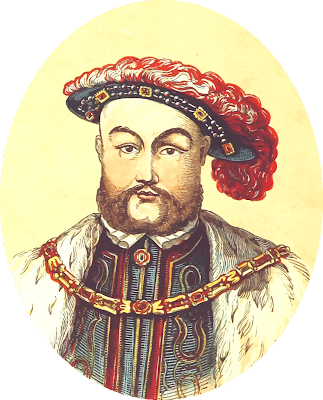 One of the more fascinating Tudors is King Henry VIII. Part of what makes Henry VIII such an interesting study relates to his many marriages and what happened to his wives once their marriage was over. 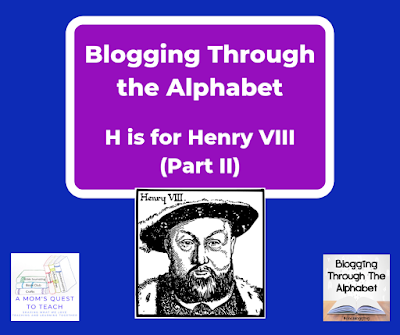 In an earlier post, I addressed the early years of the life of Henry VIII, his marriage to his first wife, Catherine of Aragon, and their subsequent divorce. After the marriage between King Henry VIII and Queen Catherine of Aragon ended at his request, Henry VIII was ready for his marriage to Anne Boleyn to be confirmed. Archbishop Cranmer declared the secret marriage that had taken place in January 1533 between Henry VIII and Anne Boleyn to be valid. With this, Henry had renewed hopes for a male heir. By June 1533, Anne Boleyn was crowed Queen but she was still seen as the King's whore to the people. On September 7, 1533, Princess Elizabeth was born, even though astrologers had told the King it would be a boy. With Elizabeth's birth, Anne began losing her power over Henry. In hopes that Henry and Anne's next child would be a boy, the leading subjects began taking the oath to the Act of Succession in March 1534. This Act finalized the idea that Henry and Catherine's daughter, Mary, was illegitimate and was not an heir to the Tudor throne. Anne had three more pregnancies that ended in stillbirths. In April 1536, the search for evidence for Anne's downfall began. Five men were accused of adultery, including her brother, and they were convicted. Anne was found guilty of adultery and treason. Before Anne's execution, Archbishop Cranmer declared that Anne had never lawfully been married to Henry because of a pre-contract to another man and the King's relationship with her sister, Mary. On May 19, 1536, "the happiest of women" lost her life with a single cut of the blade and Henry wore white in mourning for her. Several months before Anne's execution, Catherine died and this paved the way for Henry's next marriage after Anne Boleyn. There would be no more questions regarding his divorce of Catherine. A day after Anne's execution, Henry was betrothed to Jane Seymour and by the end of May they were married. Jane was a modest and shy woman who appeared to be overwhelmed by the royal lifestyle. Jane succeeded in bringing peace between Henry and his first daughter, Mary, who was now 20 years old. From Jane, Henry would receive what he had longed for so many years: a male heir. "Bound to Obey and Serve"
Prince Edward was born by Cesarean section on October 12, 1537. Jane soon fell ill after the pregnancy probably due to puerperal fever (which was a common hazard for women in this time period after childbirth). On October 24, 1537, at the age of 29, Jane Seymour died. Henry left plans that he was to be buried beside the Queen who never even had a coronation ceremony. While Henry and Jane were married, the Crown began seizing church property. Shortly after the closing of smaller churches, a rebellion broke out. Jane unsuccessfully pleaded with Henry to restore the lesser monasteries since it was their closing that had caused the rebellion. By the end of the year 1536, the leaders of the rebellion were executed in spite of Henry's promise to send them aid and a promise of a visit to the North. By 1540, all religious houses were closed with Henry receiving he money from them. 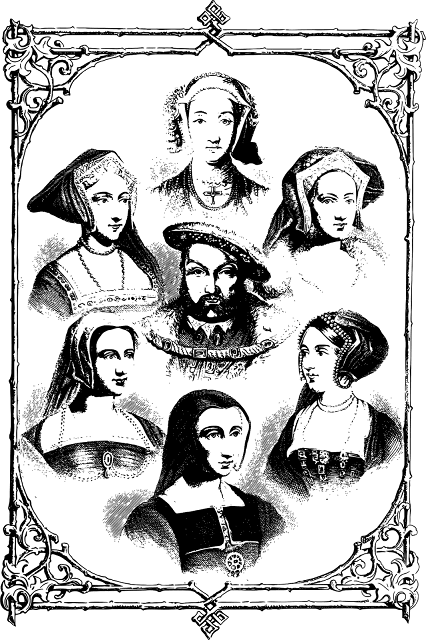 Even with three children (one a male heir), King Henry VIII still sought out his next bride. He would marry three more times before dying in January 1547. His reign of England was a decisive one in English history. He brought Protestantism to England through his Reformation. He also brought England back into continental Europe while his foreign policy restored England as a war-faring nation again. Henry is more than just a man who married six times. Want to learn more about English historical figures and history? 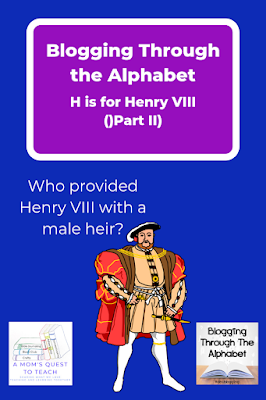 Read more about Henry VIII, Elizabeth I, and Knights. 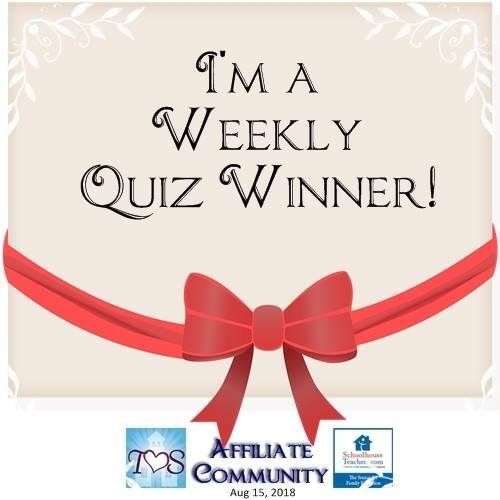 Do you want to join the Blogging Through the Alphabet posts this week? Love this! I recently found a series of books written from the perspective of each of his wives. I can't wait to read the series. His marriage record certainly proclaims his power, doesn't it?